Education is important, but camping is importanter! Thursday, February 15, 2018: Up, broke camp and underway shortly after the noon hour. Pointed the rig south from Usery Mountain Regional Park and threaded our way through Mesa, Arizona while enjoying sunny skies and temperatures in the mid 60’s. At 1220 hours, Kit and I pulled into Lost Dutchman State Park for an overnight stay. So, for those of you keeping score, that’s a total travel time of nineteen minutes to cover the 13 miles. And why did we bother to move such a short distance? Well, since you asked, Kit and I like to seek out and explore places we’ve never been…and this beautiful Arizona State Park is one of those places. So, why did we only stay one night? Boy, you folks have a lot of questions this morning! Well, we had wanted to stay longer but this being a holiday weekend, the campground was booked solid…we literally scored the only site available in the park, and that was due to a cancellation. And that site was extremely tight to maneuver into! Of course, due to the “Law of RV Parking Observation”, if there had been fellow campers about to watch…I would have likely put on a demonstration of “Parking by Braille”. But with no one around, and with Kit’s excellent hand gestures…some of which would be rated as PG-13…I was able to slip that 45-foot by 8 ½-foot rig into the short and narrow site on the first try! And all during a pop-up rain squall! You can congratulate us later. 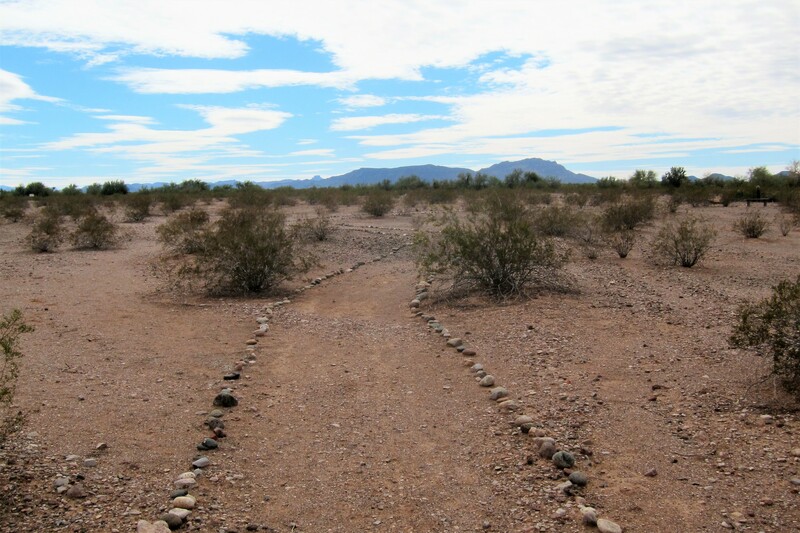 Lost Dutchman State Park is located in the Central Arizona community of Apache Junction. 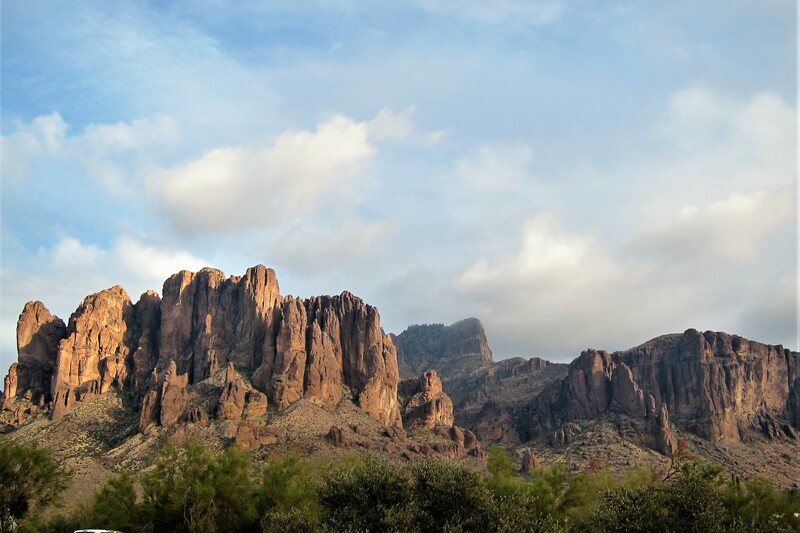 The 320-acre park is named after the Lost Dutchman Mine. 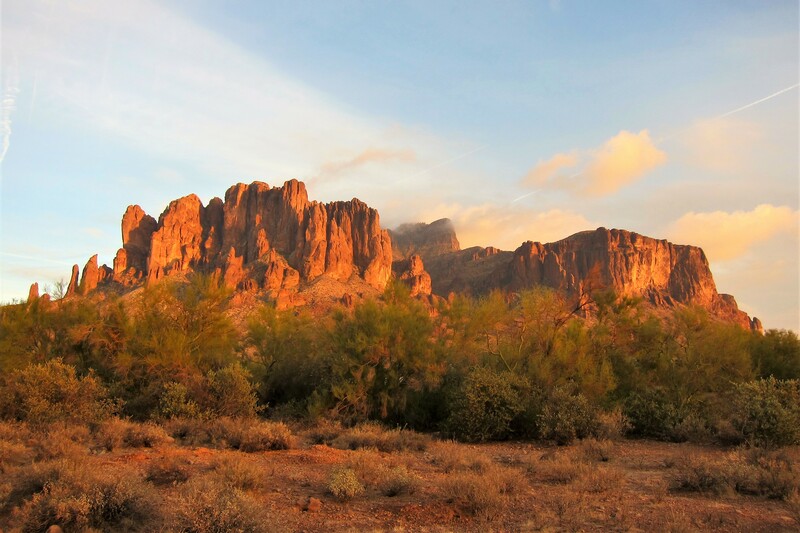 As the legend goes, a German (Dutch) immigrant discovered a very productive gold vein in the rugged Superstition Mountains. Being worried that other miners might jump his claim, the Dutchman never legally filed papers on the find or drew any maps as to its location. 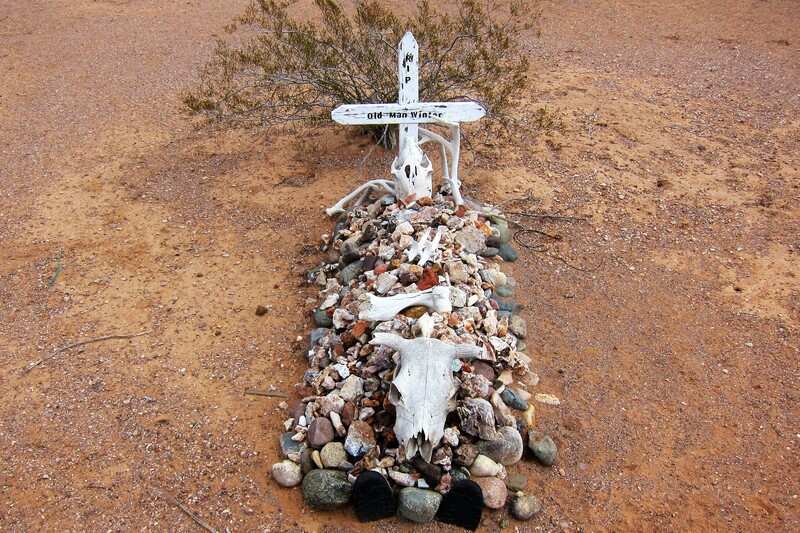 The only hint of “gold in them thar hills” was when his body was found in 1891 with his gold-filled saddlebags nearby. Since the gold wasn’t taken, speculation was that he had been done in by Apache Indians led by Geronimo. You see, the Apache people worshiped the mountain and did not like folks walking in and carrying part of it as the Dutchman had done. Treasure hunters have been searching for the Dutchman’s lost goldmine ever since. …so, I guess there really is gold in them thar hills after all! Friday, February 16, 2018: As Kit caught up on her beauty sleep, I grabbed a mug of hot coffee and took a stroll about the campground. The morning was frosty as the eastern sky was beginning to awaken for another day. 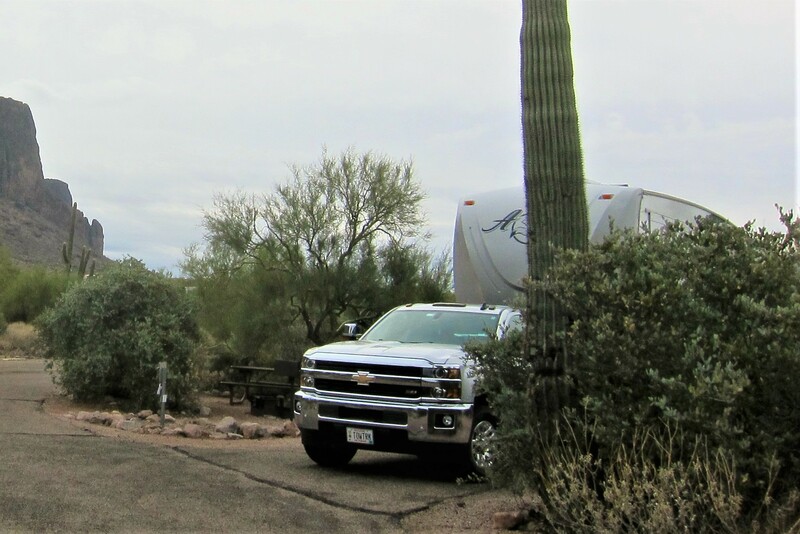 Back at the campsite, Kit and I enjoyed a leisurely breakfast, then broke camp before pulling out of Lost Dutchman State Park at 1015 hours…the skies where partly cloudy and the temperature 61 degrees. 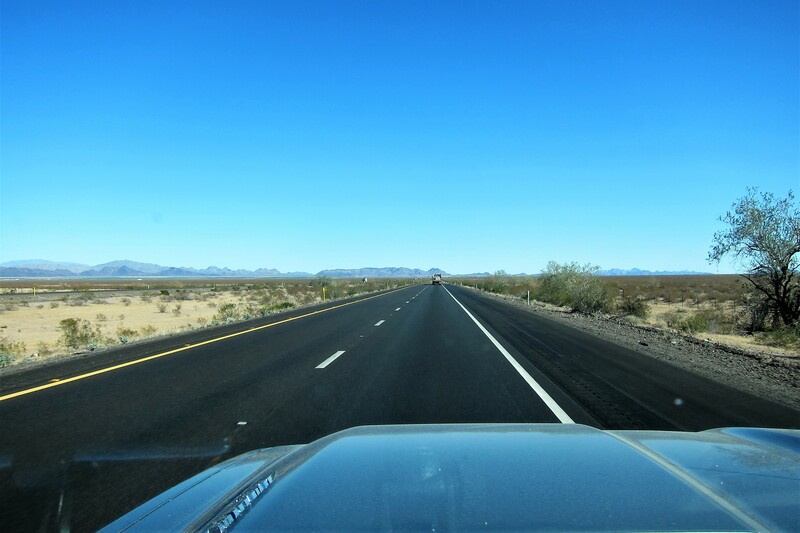 Clearing the Phoenix metropolitan area, we headed south then west on a variety of back roads toward the tiny Arizona town of Gila Bend. The morning gloom had burned off and the temperatures were rising into the upper 70’s, which is within my personal temperature range of 65 to 85 degrees. Having missed out on the hardening one develops by wintering over in Maine, I’ve become a real weather wimp! Anything lower than 65 feels chilly, but anything above 85 seems too hot!?!? 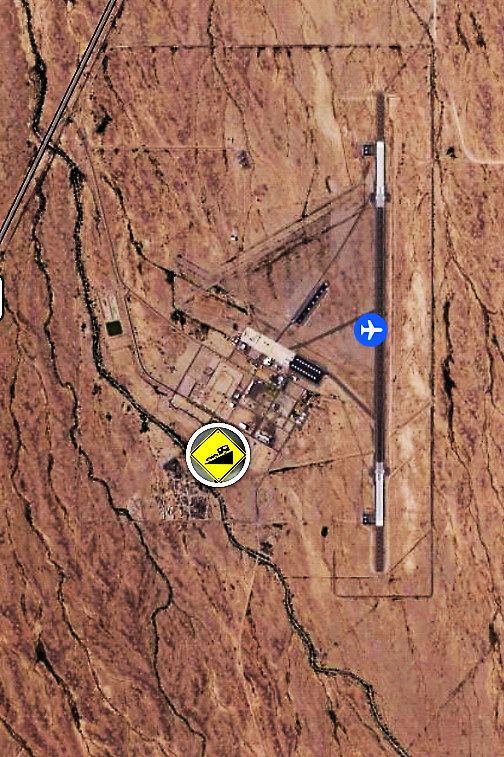 Our actual destination is just south of Gila Bend where the USAF Auxiliary Field lies in the middle of nowhere! A perfect spot to uncouple from humanity and layover for a few days…isolated, inexpensive, and rarely full, this campground has become our “go to” spot to veg out, dump holding tanks, fill fresh water, take care of periodic trailer maintenance and get the piles of dirty clothes attended to at their free laundry facility. Saturday, February 17 and Sunday, February 18, 2018-Gila Bend Air Force Auxiliary Field: This remote USAF facility, a divert field and high-risk aircraft training base, is managed by Luke Air Force Base in Phoenix. 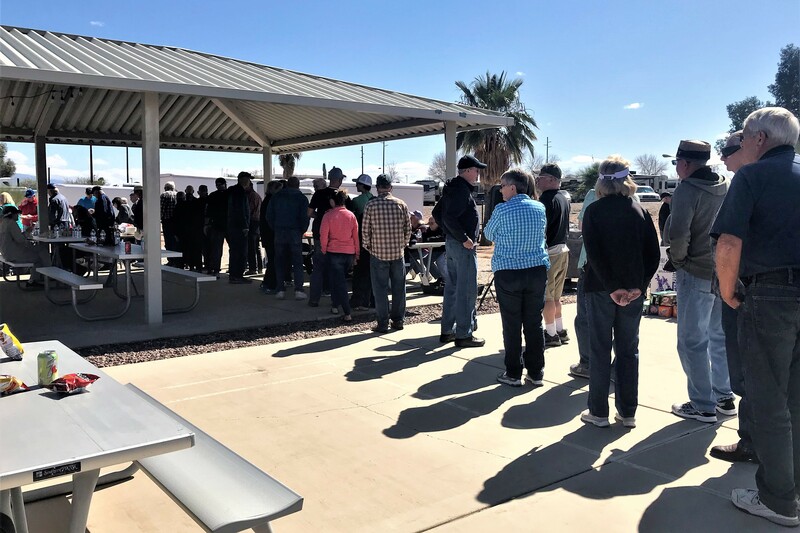 In addition to a handful of government contractors, it is also populated by a gaggle of hardy military retirees who reside for the winter in the dusty campground. If one is a military retiree hermit, this would be the place for them! 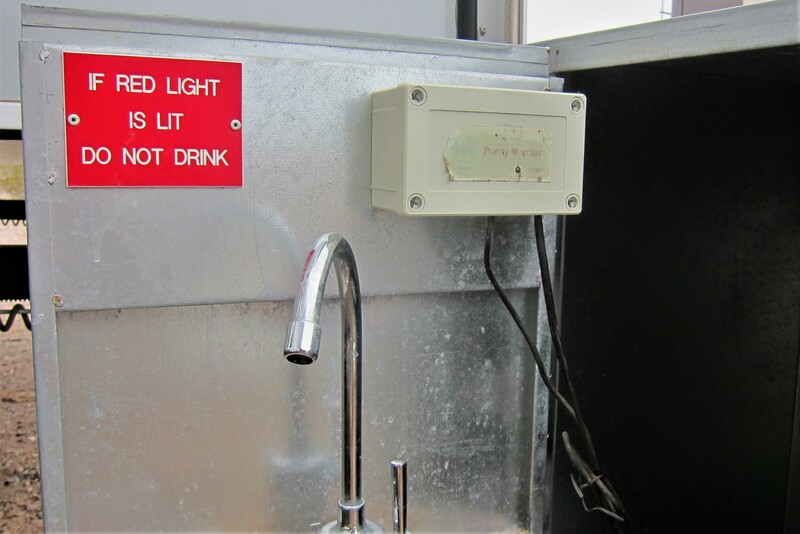 The base is so remote that there isn’t even a public water supply…so, each campsite features a reverse osmosis water treatment system. And barbeques are fabricated from found items lying about. I bet the first fire in that pit was interesting! As a snowbird haven it is ridiculously inexpensive, even by military standards! The regulars are very friendly and reach out to newcomers, even though most are just passing through as we were. 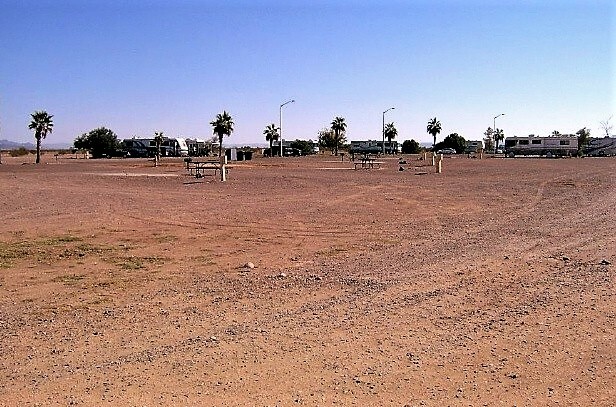 On the campground premises is a small but clean laundry/lounge area and a really neat walking/biking trail that winds through the barren desert. One just has to be aware of their surroundings and heed any caution signs. … as Old Man Winter apparently did! 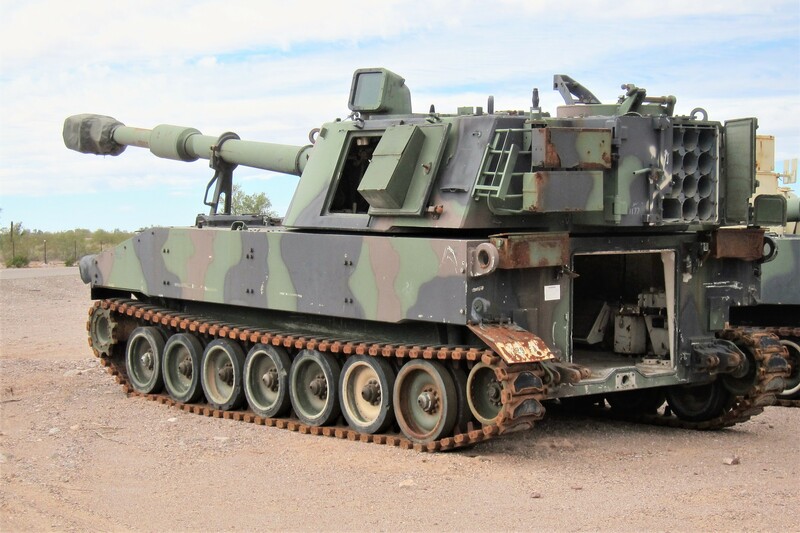 retirees and battle tanks…is that redundant? If these things could talk, oh what a story they might have to tell! Dozens of these implements of destruction were lined up in the open with no barrier of any kind around them. Many had their armored doors ajar and looked as if they could be started and taken for a joy ride! Tempting, but probably not wise, I guess. 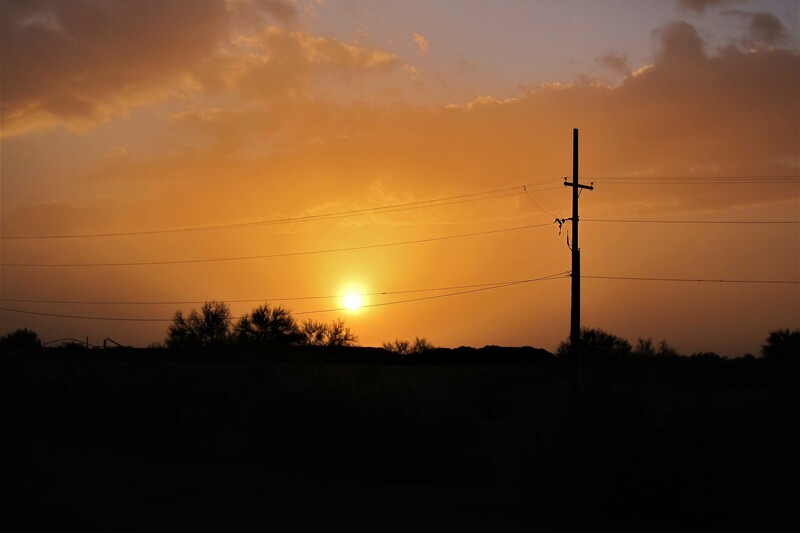 After a hearty meal, Kit and I discussed which direction to head in the morning while enjoying a plastic cup of fine boxed wine…and observed the sun plunging to the western horizon bordering this oasis in the vast desert. Monday, February 19, 2018: False alarm…not leaving today after all! 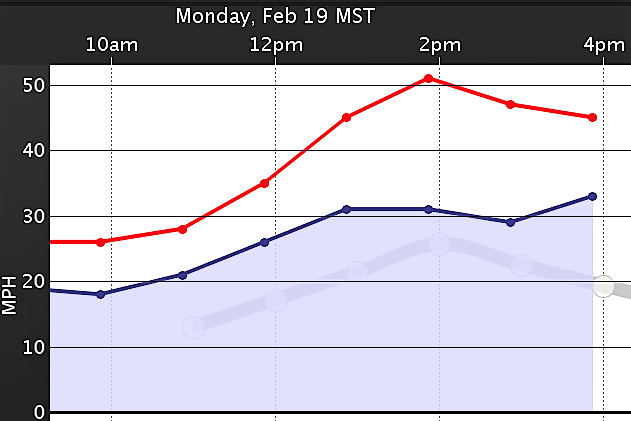 The wind whipped up overnight and travel in a high-profile vehicle would be crazy! So, spent the day just goofing off, and hanging out…for the most part inside the camper which was being buffeted by wind gusts of 50 MPH! 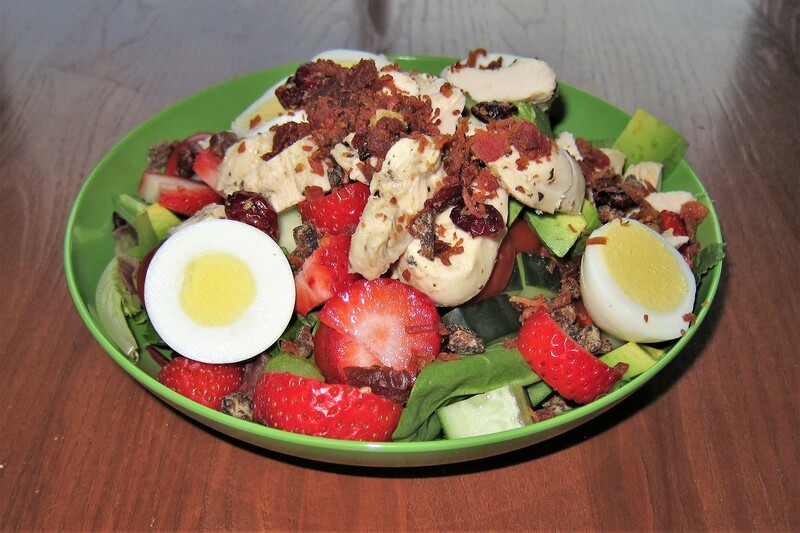 As a special trailer bound treat, Kit constructed one of her awesome signature salads…a nutritious and complete meal in a bowl! 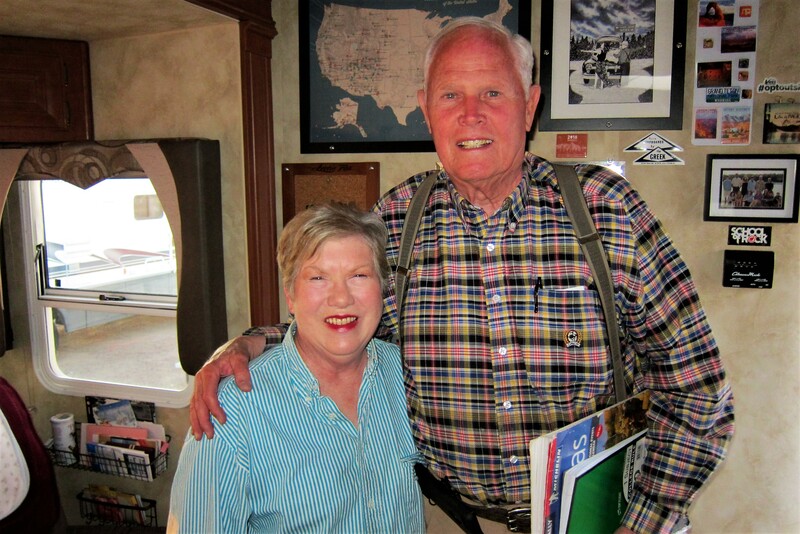 Tuesday, February 20, 2018: Up and over breakfast, Kit and I finalized our travel plans between now and Friday…when we plan to descend on brother Danny, Dewey, and sister in law Bea. 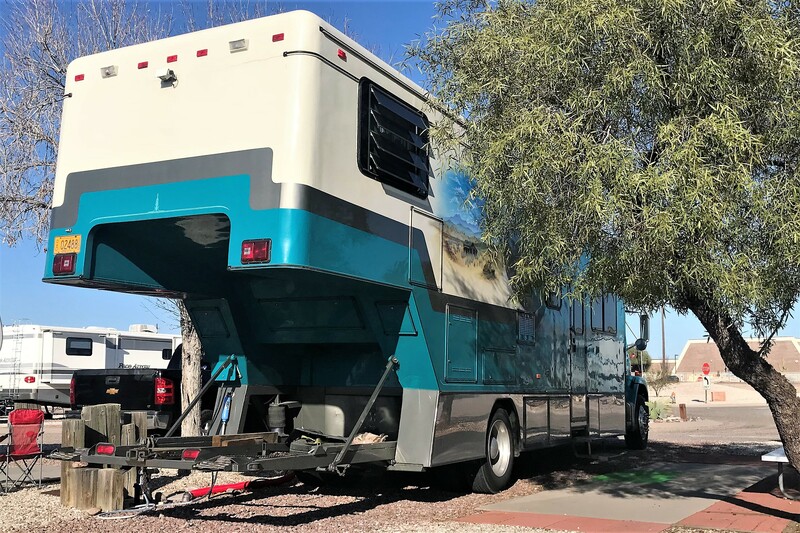 We discussed visiting Organ Pipe Cactus National Monument again, or poking around Quartzite, or staying at Kartchner Caverns State Park, or heading down to the border and hanging out at Fort Huachuca. However, in the end, we decided to head to Davis Monthan Air Force Base (DMAFB). 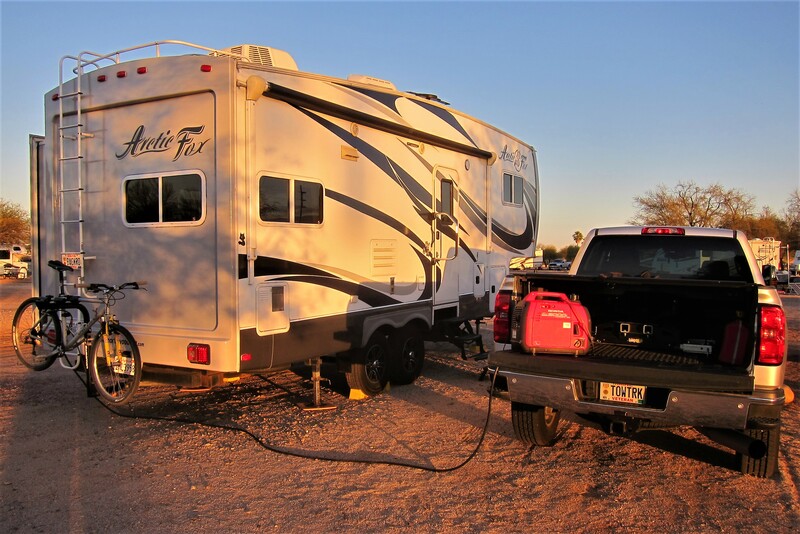 This USAF base south of Tucson is one of the top ranked RV Parks in the military system. Since Dewey and Bea live so close, we seldom have an opportunity to spend time here, and it’s a great spot to resupply…so, by unanimous decision, we pack up and head to DMAFB, 125 miles to the south. 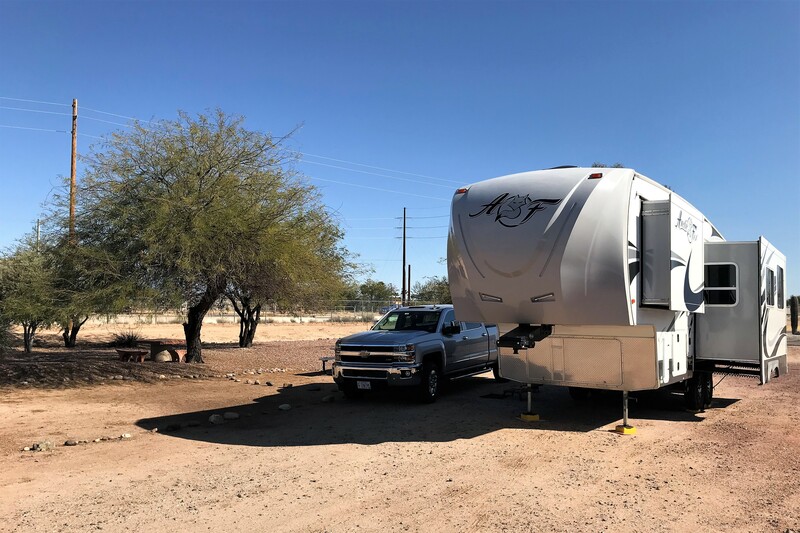 The base campground, known as Agave Gulch, has a large overflow area and a no-turn-away policy which allows everyone an opportunity to score a spot. And, their very fair rotation system results in moving to a full-hook-up spot in a day or two. 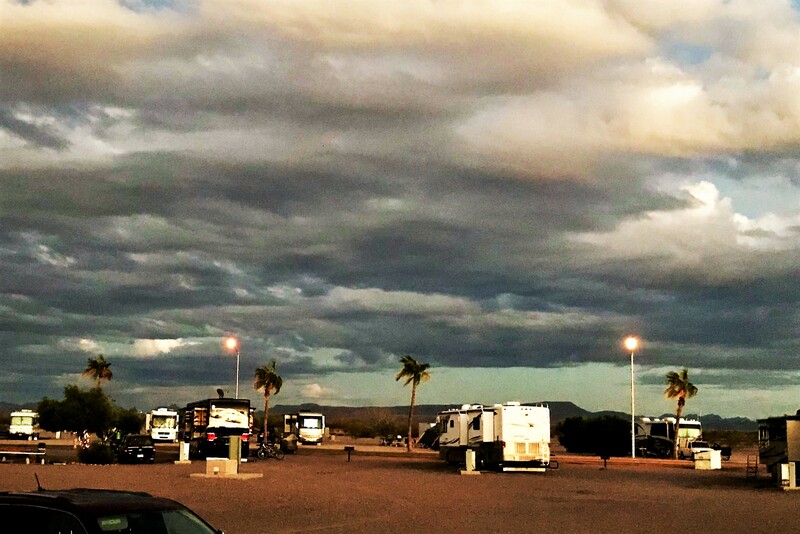 However, with the destruction of some military campgrounds from hurricanes in the southeast and Florida, this year Agave Gulch has more campers than normal so the wait to move from overflow to a full-hook-up site is more than a week. Since we were to only be on base for a few days, Kit and I decided to find a nice spot in overflow and stay off the rotation list. As you can see, the sun was setting so it’s time to say goodnight once again. Wednesday, February 21 and Thursday, February 22, 2018: Agave Gulch RV Park, Davis-Monthan Air Force Base: Woke to a beautiful Tucson morning following a very restful sleep! Kit and I do not mind camping without hook-ups. Our current unit is purpose built for off grid camping…with large capacity holding tanks, dual batteries, two 40# propane tanks, and supplemental power in the form of a Honda 2000-watt generator, dry camping is no longer an issue for us…in fact, there have been situations where we prefer to be in a nicer spot away from the main campground! 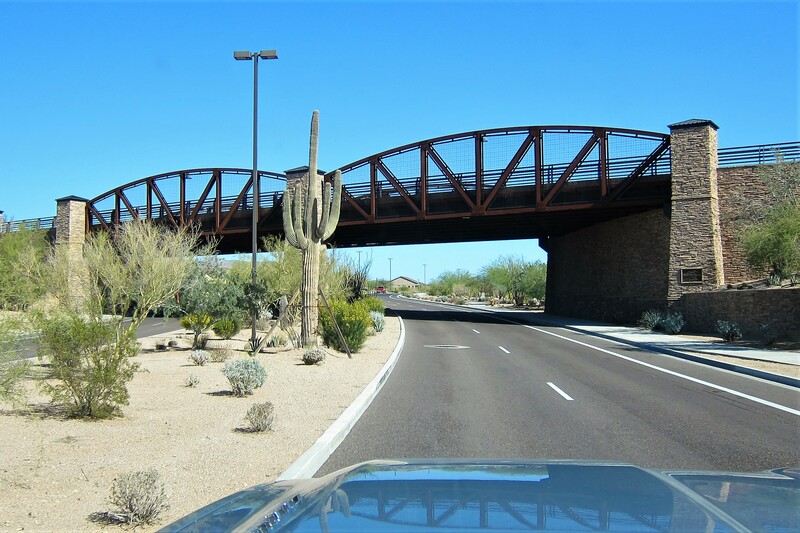 Case in point, the site we chose in the overflow section of Agave Gulch bordered a nicely landscaped community area that received little use. 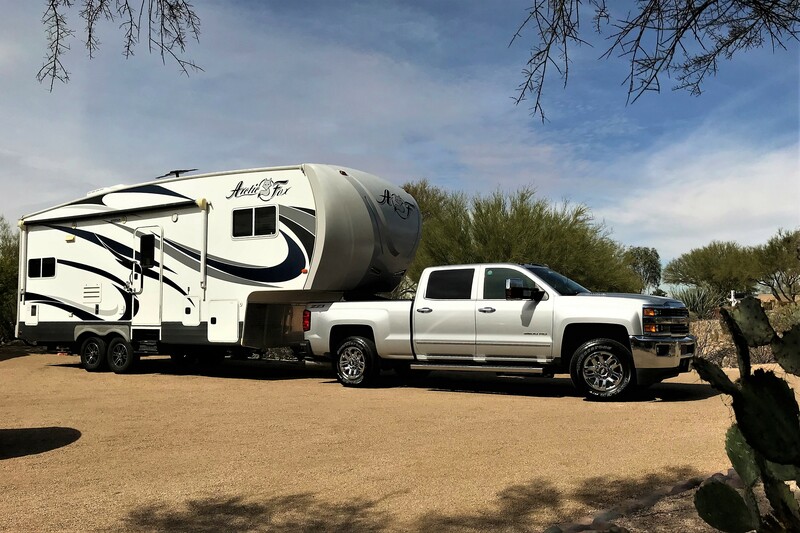 The bulk of our stay on DMAFB was spent cleaning up the truck and trailer, shopping at the Post Exchange and Commissary, topping off the fuel tank, and getting a depleted propane tank filled. However, one afternoon a local RV dealership sponsored a barbeque for the folks at Agave Gulch. 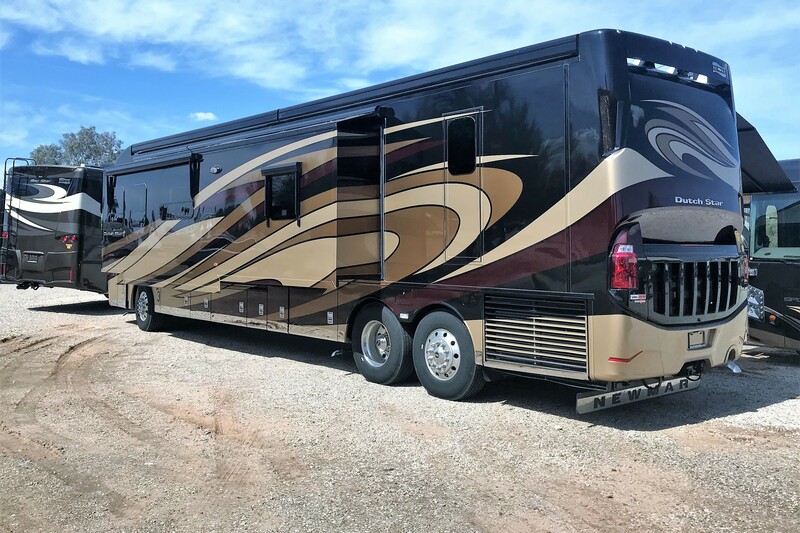 Billed as a “thank you for your service” event, the RV dealer, a military retiree himself, brought some of his newest models to showcase…such as this 43-foot motorhome. A very nice rig, nicer than our home…however, with an MSRP of $435,000.00, way too rich for our blood. 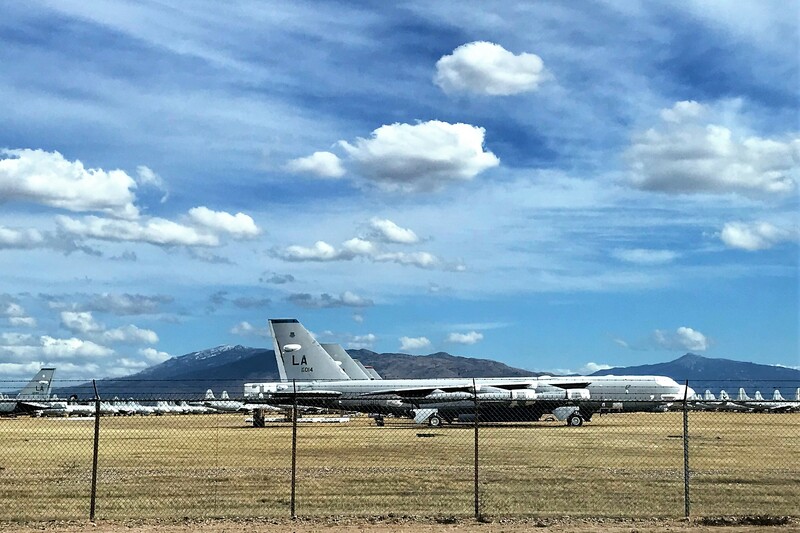 As has been profiled in previous years journals, DMAFB is home to the famed “Boneyard”. 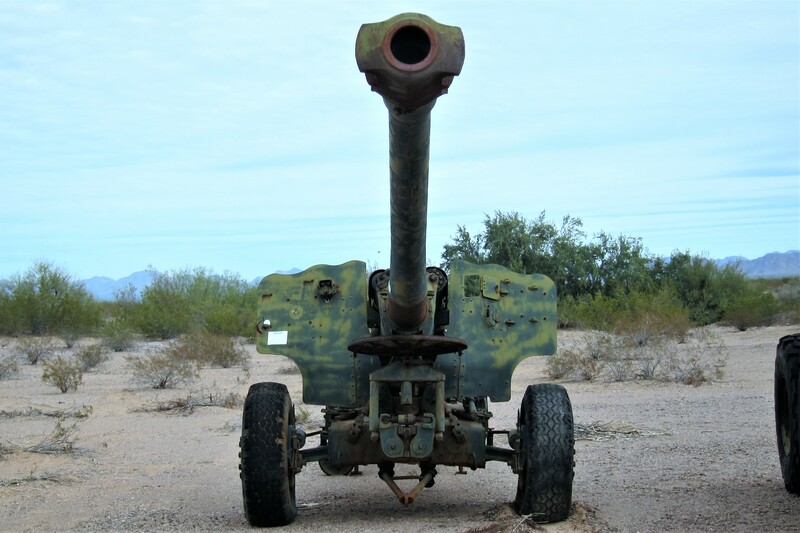 As in Gila Bend, this portion of the Sonoran Desert is the perfect environment to store old military hardware that may, at some point, have some useful life remaining. 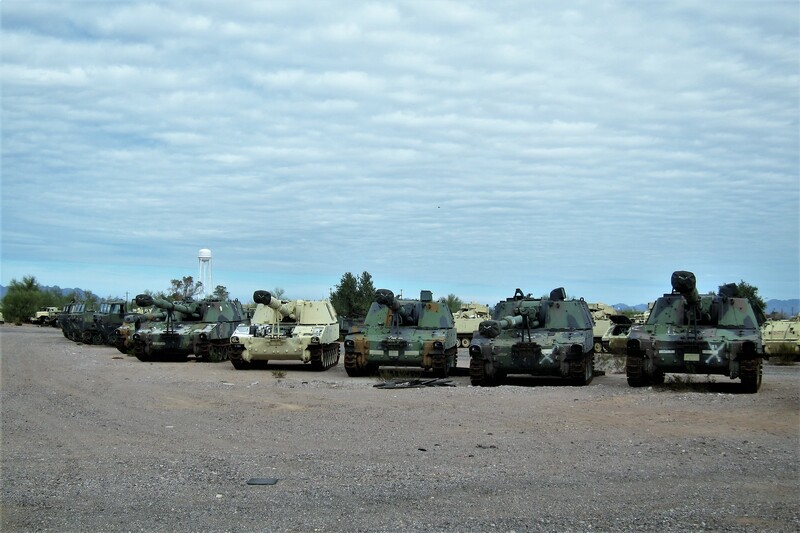 And apparently, old military “software” as well, since the campground is right across the street from the boneyard. Coincidence? I think not! 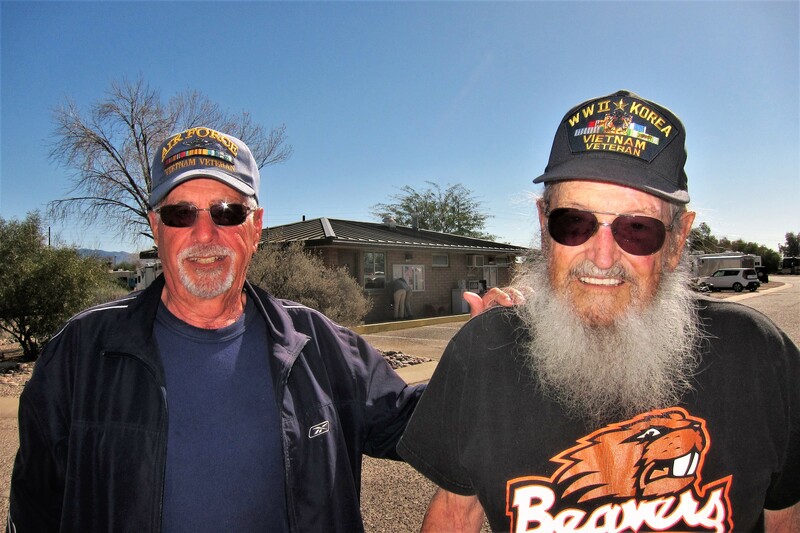 During these trips, I enjoy seeking out interesting characters and hearing their stories…such as these two veterans. The gentleman on the right is a WWII-Korea-Vietnam vet…a rare commodity these days. At 93 years young, he still gets around quite well and enjoys RV’ing to the American Southwest. Enlisting in 1943 as a Navy Seaman, and serving on diesel submarines in the south pacific, he retired 30 years later as an Executive Officer on a Navy Destroyer. The fellow to the left is Richard, a USAF retiree from Wales, Maine, another rare commodity in that most Mainers hibernate in place or head for Florida…quite rare to see another one this far west of the Mississippi River! Kit and I enjoyed visiting with Richard and his wife Diane. They also introduced us to another expat couple who migrated out here from Topsham, Maine! Didn’t get a photo of Larry and Cindy but we all agreed to reconnect this summer…looking forward to it! Kit and I also reconnected with another interesting couple who plan on touring New England this summer. Ben and Diane are from Idaho Falls, and met in Vietnam. He being a helicopter pilot and her a Red Cross Donut Dolly! They had some interesting stories to tell and we invited them to dooryard surf at our home for a few days during their New England adventure. 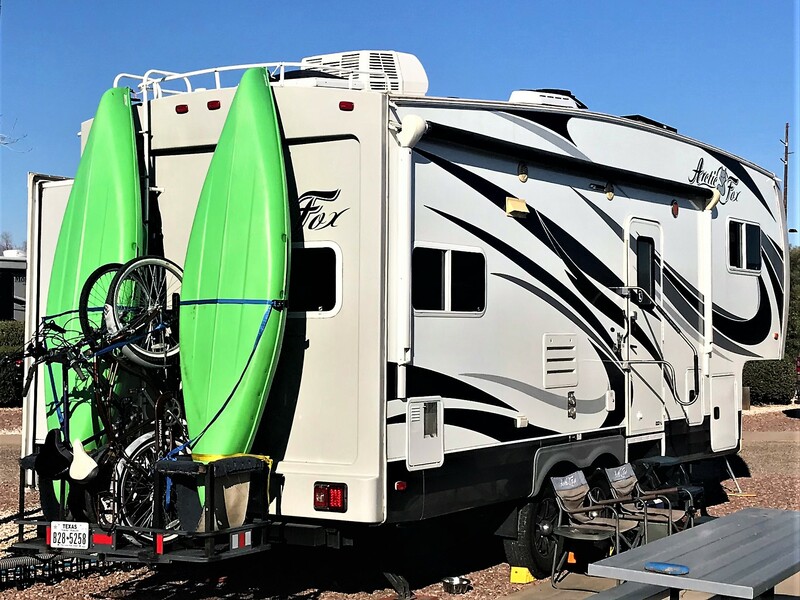 Ever since we purchased our fifth wheel camper three years ago, I’ve been whining about the inability to safely carry a kayak…so when I spotted this rack hung on the back of a trailer identical to ours, I took note. Custom made by a certified welder from the owner’s design, the rack connects to the standard tow receiver and carries two kayaks and two bicycles! A lot of weight so far to the rear could be a problem, but the owner reports it hasn’t been an issue so far. This might be a viable solution to my predicament, so I snapped a dozen detailed photos just in case. Another interesting camper we noticed in the park was this custom-made toy-hauler. According to the owner, there are only two of these in the world as the manufacturer went out of business after a very short production run. The rear cavity features a hydraulic ramp that lowers to allow a small car, in this case a Mazda Miata, to be loaded…then the ramp is raised to about 20 degrees above horizontal for travel. Pretty nifty! Back at our campsite, nighttime fell while storm clouds gathered, so Kit and I decided to turn in early. Tomorrow is a big day as we relocate to the DewBea RV Resort for what promises to be an exciting and fun filled two weeks stay…stay tuned! Friday, February 23, 2018: Up, breakfast, and on the road at 1006 hours. We pulled the rig into the large Post Exchange parking lot, so Kit could grab a few additional items of necessity as I spent the hour working on photo editing. Back underway we left the base and headed toward CasasAdobes. 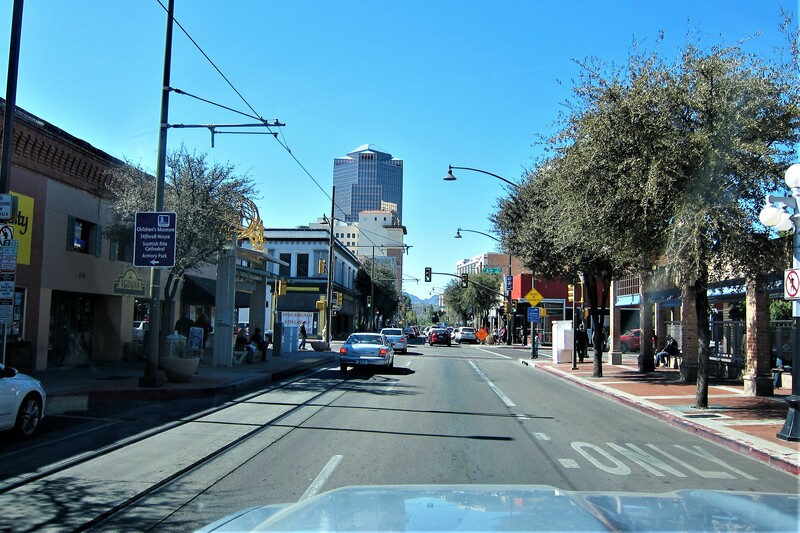 The GPS we use to navigate unfamiliar terrain is programed to take us on a route that is most expeditious…even if that route requires dragging a trailer through downtown city streets. Actually, we anticipated this as it’s the route we’ve used many times to travel from DMAFB to Interstate 10. As most GPS systems allow, I could have entered avoidance criteria to bypass congested areas, but in this case that would have sent us south quite a ways, when we actually want to head north. Besides it was fun seeing the stares of the downtown denizens as we crept down the street. Within 45 minutes we were pulling into the DewBea RV Resort for a two week stay. This premier full-hook-up spot is a very exclusive, private, and amenity rich camping opportunity…one we have enjoyed many times in the past! Looking forward to “Fun in the Sun” and “Rage in the Sage” with two fun loving people…stay tuned! Kit’s Bit’s: This has been a leisurely and restful week. We thoroughly enjoyed Usery Park and Lost Dutchman Park. We had heard of these parks from other people over the years and were finally able to check them out. 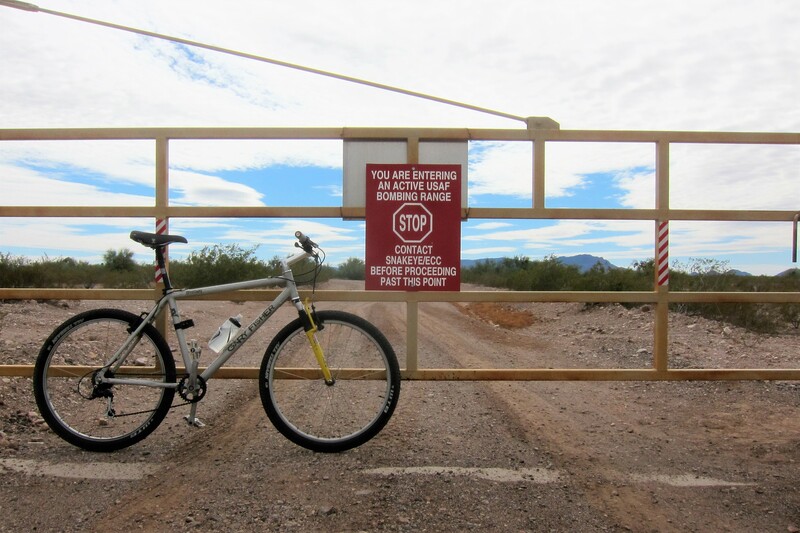 Having a couple of “down days” at Gila Bend was nice, as well. However, upon entering DM Park, we met so many people from Maine, and even a few from Vermont! A very unusual event for us! Then, just a day before leaving, we ran into Ben and Diane from Idaho Falls! We have met them before but none of us can remember where or when. It was nice to see them again. On to Casas Adobes to visit with Dewey, Bea and Dan! 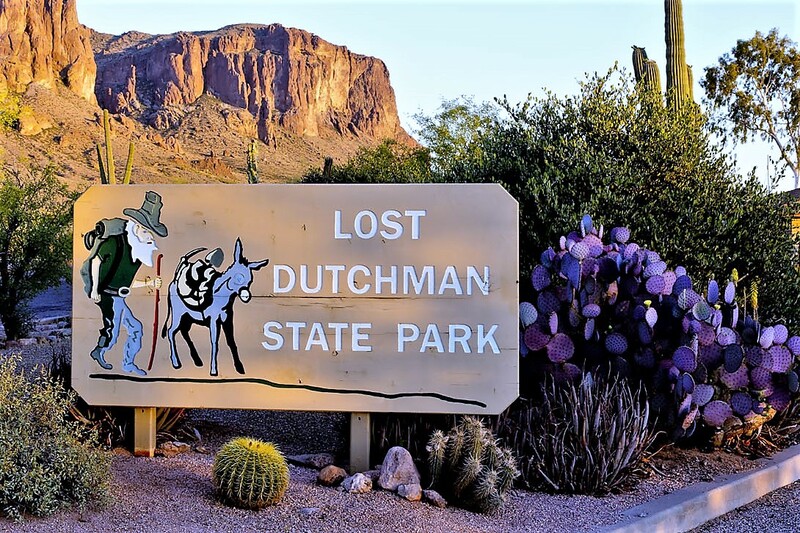 Interesting info on the Lost Dutchman State Park. 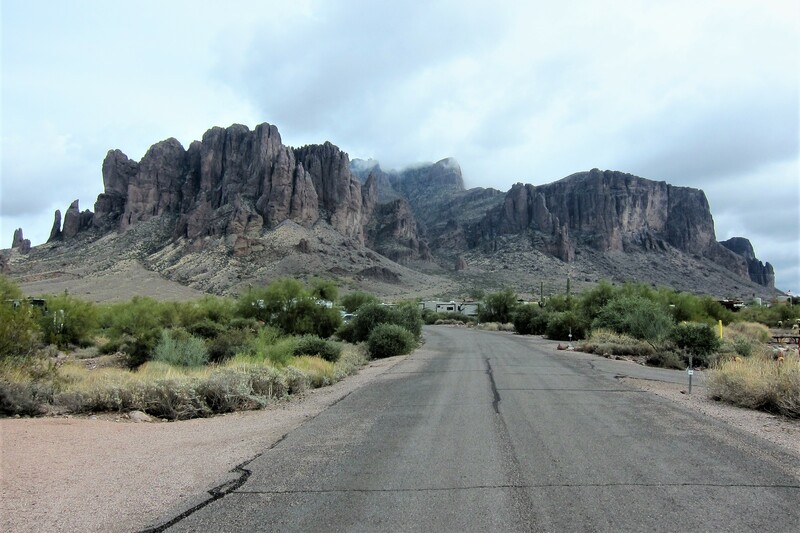 Love the Superstition Mtns! 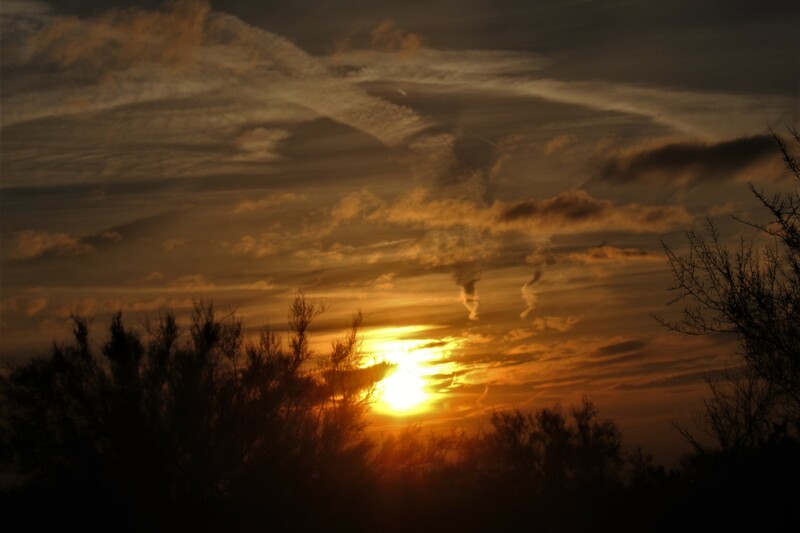 The pic of the sunset and the Mtns is gorgeous…very interesting cloud formation. 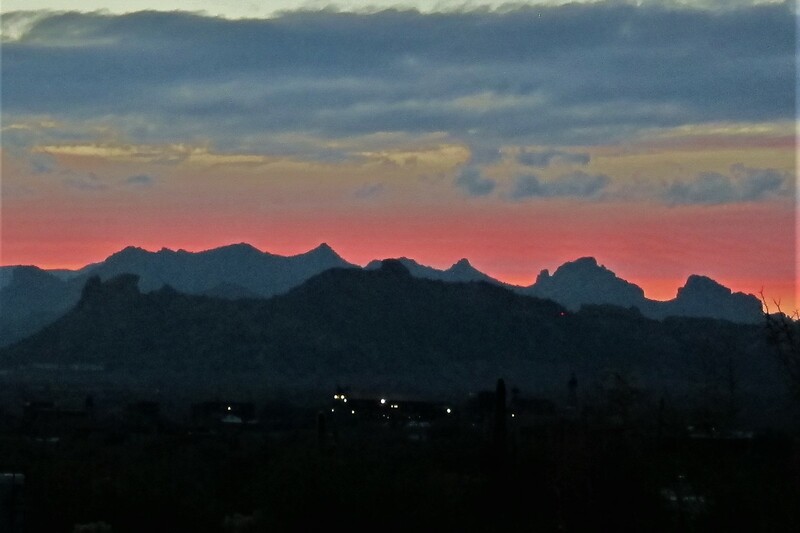 My jaw dropped when I saw the shot of the silhouette of mtns against the pink sky! Absolutely stunning! 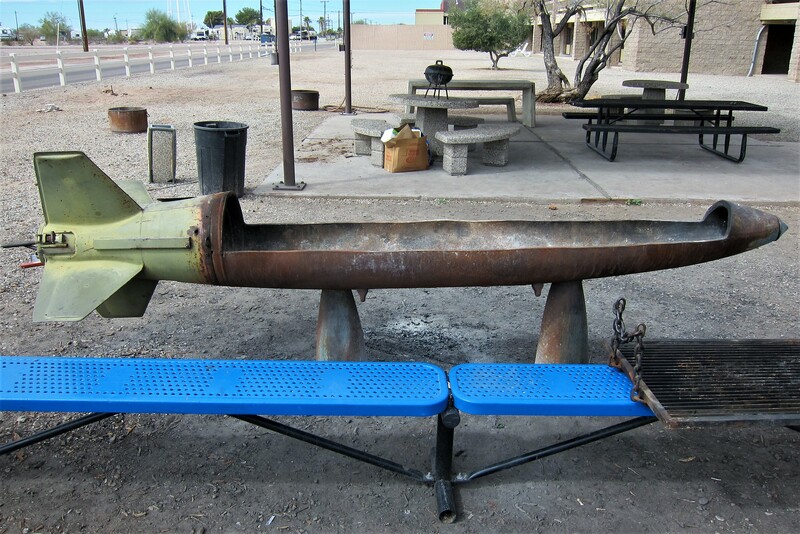 ….Someone was very clever creating that torpedo fire pit. Bet there would be a market for them with military retirees especialkyvNavy retirees. USAP Auxiliary Field looks like a great spot to stay awhile and explore…love the desert trails…..Delicious-looking salad Kit! …What a nice surprise to have met so many Mainers at the park. 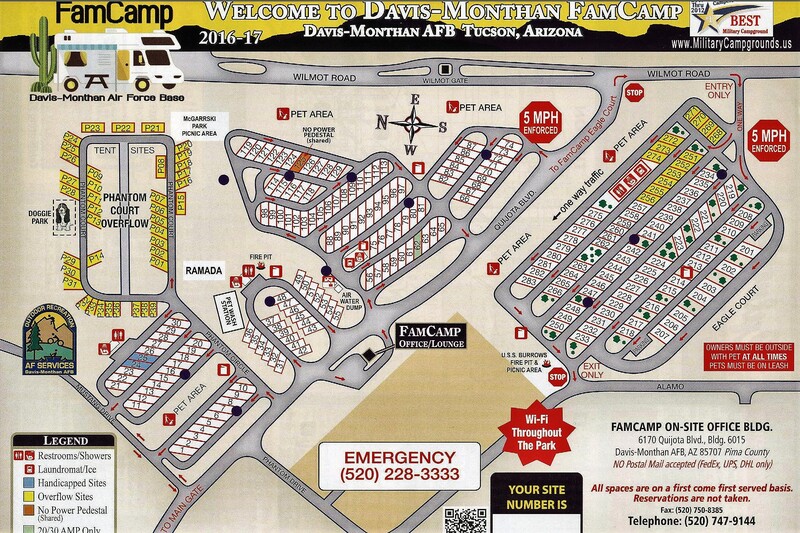 …Have fun at the Dew/Bea RV Park! GREAT SUNSET AND SUNRISE PICS!! BILL, I HOPE YOU DIDN’T GET TOO WET WHILE SITTING IN THE CAB DURING A RAIN SHOWER AND KIT OUT SIDE GUIDING YOU INTO A TIGHT PARKING SPOT!! PRETTY CHILLY HERE THE PAST FEW DAYS! IT LOOKS LIKE ANOTHER NOREASTER IS HEADING OUR WAY, HOPEFULLY WE WILL ONLY SEE RAIN FROM THIS ONE! HAPPY MOTORING AND ENJOY YOUR STAY AT DEWBEA RV RESORT. LOVED YOUR LUCIOUS SPINACH SALAD, KIT! I TOO PAIR SPINACH AND STRAWBERRIES – MAGIC! IN ADDITION TO CHICKEN, BACON BITS AND EGG, I ADD SLIVERED ALMONDS FOR SOME NICE CRUNCH AND TEXTURE. I HAVE A SWEET DRESSING THAT COMPLIMENTS SPINACH AND STRAWBERRIES BEAUTIFULLY. PEOPLE SAY THE SALAD TASTES LIKE “DESSERT”! I’LL EMAIL IT TO YOU IF YOU’D LIKE. Another very interesting blog. Love the Dutchman story. Fun hearing about New and old friends. Enjoy your relatives! Everybody needs their Gila Bend! Nice to just “collapse” every now and then without worrying about what others are doing or what they think! Give our love to the lovely owner/managers of DewBea R V Resort! Enjoy your 2 weeks with them. I know that the time has passed, but I can pretend can’t I? Miss you two! Looking forward to being together again in Maine. Safe travels and enjoy!! Great narrative and pictures as usual Bill. Picked up a Grand Laker canoe, trailer and 6 HP motor recently. Getting lazy (lazier) in my old age! Tell Kathy I loved the look of her salad. Also – nice looking RV photos along with all the rest. The B-52 was a favorite since I flew in one in the AF many moons ago.